Paul Regier received a PhD in neuroscience from the University of Minnesota, where he studied addiction and the neurophysiology of decision-making in rats. He is currently a postdoc at the University of Pennsylvania, where he studies addiction in people, using fMRI to examine how brain reactivity to evocative cues predicts drug relapse. On the side, Paul Regier writes about neuroscience, addiction, and speculative fiction integrated with real science. His writing can be found on Medium, and he can be followed on Twitter. The idea that we only use 10% of our brains continues despite multiple efforts to set the record straight. Surprisingly, almost two-thirds of people in the U.S. still believe the myth is true. Even MythBusters tested it and concluded that the 10% part was untrue but only upped that figure to 35%. It’s just not true. I’ll explain why and then give some tips on using neuroscience in fiction. The 10% idea is an attractive concept, especially in sci-fi. It’s been the theme of two major blockbusters in recent years. In Limitless, the protagonist, played by Bradley Cooper, takes a drug that increases the percentage of the brain he can use and is able to remember everything, he’s able to learn new languages within hours, and he’s able to plan moves and take action with superhuman precision to escape pursuers and win fights. In Lucy, the protagonist, played by Scarlett Johannsen, progressively increases the percentage of her brain she can use and becomes more and more powerful. She gains telekinetic powers and meshes with computers. All the while, a trustworthy voice in cinema — that of Morgan Freeman — narrates her neural progress and the potential that comes with it. To illustrate, take even a simple task, such as reading this article. 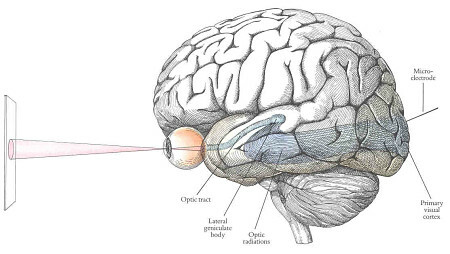 Information enters our eyes and is sent to a “relay” system, called the thalamus, which sends the signal to our visual cortex (Figure 1). As visual information is continually being processed in this manner, the symbols we have learned to recognize as words are interpreted by Wernicke’s area. Without it, we couldn’t understand language. As you continue with the article, you need working memory to keep track of what you’ve just read, a process mediated by areas such as the hippocampus. Then, according to a couple MIT neuroscientists, Rebecca Saxe and Liane Young, several cortical areas get involved as we think about mental (words) and physical (people, places, etc) representations (Figure 2). Thus the result of a very basic action like reading a paragraph or two is that several brain regions are active; areas involved with vision, word recognition, language comprehension, working memory, executive function, and other cognition. By now, you might be thinking, “Okay, okay, I get it.” But that’s not all! While you read, other parts of the brain are also active, regions of the brain not necessarily important for reading and thinking, but just for existing. For example, if you’re sitting in a chair, the cerebellum and motor cortex are working together to keep you balanced (Figure 3). If you’re holding a phone or tablet, these two vital regions coordinate little muscle movements to make that happen. 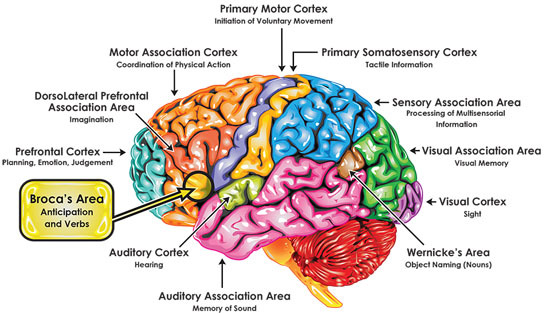 Brain regions involved with coordination of muscle movements and autonomic process, like breathing and heart rate. The middle stem-looking towards the bottom is the hindbrain, or the brain stem (Credit: Mayo Clinic). What’s that you’re hearing? That’s right, your ears are picking up on sounds, interpreted by the auditory cortex. 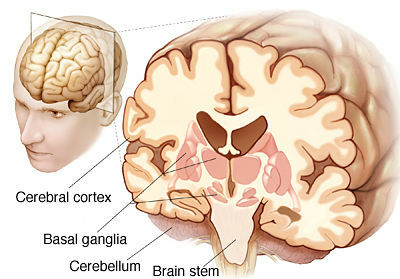 And, to top it all off, your heart and breathing and all those more automatic things happening in your body that you rarely think about are being controlled by parts of the brain stem (Figure 3). It’s pretty remarkable. Just by performing a simple task, a great deal of our brain is active, important for both conscious and subconscious processes. To illustrate how brain function can be integrated into fiction, consider this true story that sounds a lot like fiction. 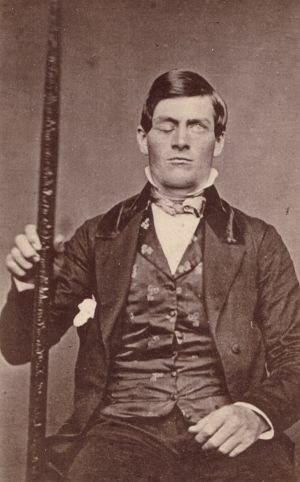 Phineas Gage was a railroad construction foreman in the early 1800s. While setting a charge in a rock with a tamping rod, a spark ignited the blasting powder and shot the rod through his head, entering at the cheek, destroying his left eye, going through the frontal part of the brain, and then coming out the top of his head, landing many yards away. The doctor who saw him after the accident remarked that Gage was talkative, though a bit tired, as Gage told the doctor about the accident. The doctor was skeptical of the story until Gage threw up, and the doctor noticed bits of brain in the mess. Gage lived for 12 more years, but his personality has often been described as completely different after the accident. He was reported to use much more profanity and to have become more impulsive. Other studies have shown how damage to certain parts of the brain cause riskier behavior or loss of long-term memory. Books by the late, great Oliver Sacks, have countless stories involving brain dysfunction that would be great inspirations for fiction stories. In sci-fi, that’s where the fun begins, since the rules can be bent. Experimentation on people might be more lax in a future world. Or, alien worlds without regulating agencies might allow for manipulation of humans, for one reason or another. But, it doesn’t just have to be damage to the brain. In cyberpunk, for example, technology is often integrated with body tissue. Think of viable ways to augment parts of the brain. I mentioned the hippocampus as important for memory. What if we found a way to directly attach something like an SD card to the hippocampus, allowing for extra storage and retrieval of that information? What if we figured out a way to integrate camera hardware with our visual cortex? Biomedical engineers are working on enhancements such as these, and brain augmentation might soon move out of science-fiction and into reality. In the digital age, it may seem daunting with all the information online to figure out what parts of the brain are active for what. The Society for Neuroscience has a blog, called BrainFacts, which is full of news and information, and they have a really nice “mapping the brain” article. 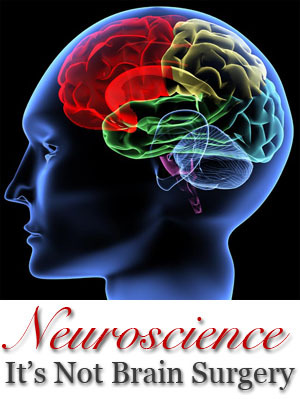 For some basic neuroscience information try this site. It’s not pretty, but it provides lots of information: vision, smell, and neurons, even the “10% of the brain” myth. We’re still learning about the brain, so there’s a lot of information about brain regions in the news all the time. Take a little time and figure out some functions of different brain areas. Then, mess with them. See what happens. Thanks for this! I’m a fiction author, medical journalist, and huge neurology geek. I already had some plans to write fiction involving neuroscience, but now I have even more ideas. Bwa-ha-ha! My first novel came out last year and involves a dimension with an alternate system of physics based on music (which is visible) and vibration. If you haven’t read it, I highly recommend R. Douglas Fields’ The Other Brain. It’s all about glia and includes a lot of great stories about how discoveries were made.